Also boasts easy, Wii-style motion control. But mainly, it's a flying, fold-up egg! Drones are now commonplace in our skies. Everywhere, they're filming, racing, and dropping deadly poison onto crowded football stadiums. Oh no, hang on, that's the plot of Thomas Harris' Black Sunday. Most drones have three major issues. 1) They are hard to fly if they're not flying directly away from you, because the orientation of the controls changes as it rotates. 2) They are a pain to transport due to their bulk, shape and relative fragility. 3) They do not look enough like a robot egg or rugby ball. Well, not any more! Meet the PowerVision PowerEgg. • Check out the best drones in the skies. • Now read this handy guide to buying a drone. • Or maybe try doing that in the opposite order. In the foreground: a PowerEgg readying for lift-off. In the background, on the vaguely futuristic table: the PowerEgg on its charging base. Once folded into its portable state, the delicate rotors and landing gear are protected, and the Egg can be easily slipped into a bag, or put under your arm and run with, like a rugby ball. Costing £1,290, and built by a Chinese multinational that's spent the last five years making industrial drones, the PowerEgg boasts the kind of cutting-edge drone spec you'd expect. So there's GPS for easy retrieval and automatic evasion of airports and other places you realy don't wanna be flying drones. You also get a video camera, shooting at 30fps in UHD or up to 120fps in HD, with "professional grade" results promised. Flying time: 23 minutes. Here is the PowerEgg in "flight" (okay, just sort of hovering there looking menacing). What's unique to PowerVision's flyer, apart from its sheer egginess, is the inclusion of a Maestro motion controller alongside the usual twin-joystick "professional" one. This allows you to ascend, descend and fly in all directions with simple gestures, including being able to spin it around for an aerial selfie without immediately reversing the controls, causing hideous confusion. Additional control is via the obligatory app, which adds all manner of functionality, from live video monitoring to a variety of navigation modes, including the ability to have it follow you, or fly to GPS way-points tapped on a map. 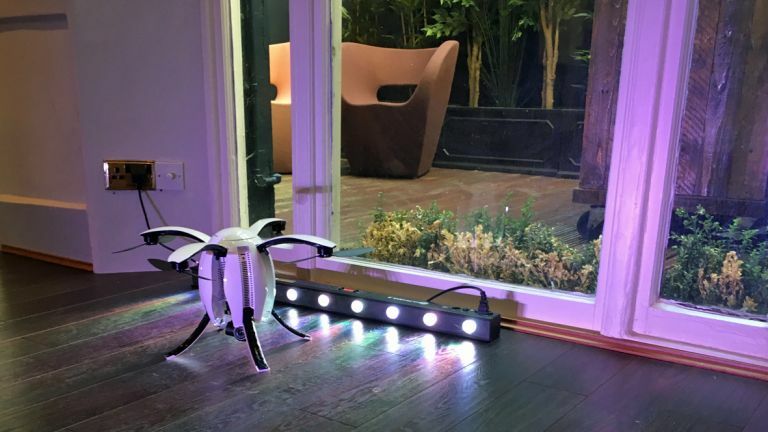 Range is more limited when using the motion control, but in Professional mode, theovoid robo bird will fly up to 3.5km in Europe and about 5km in the USA. The discrepancy is due to the differing CE and FDA wireless standards. Obvs. Price £1,290 | Pre-order from PowerVision. Pre-order customers also get a very natty Egg-carrying backpack.